Kazam announces European launch of "world's thinnest" smartphone | What Hi-Fi? 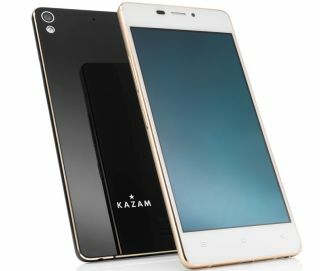 Kazam has announced the launch of the Tornado 348, which it claims to be the "world's thinnest" smartphone. It features an aluminium uni-body design and will run on the Android Kit Kat operating system. At just 5.15mm thick, the Tornado 348 certainly does have a valid claim to being the world's slimmest handset - trumping the svelte iPhone 6. Its other specs include a 4.8in 1280 x 780 AMOLED screen with Gorilla Glass, an 8MP rear-facing camera and a 5MP snapper on the front. A MediaTek True Octa-core processor with 1GB of RAM provides the power and a 2050mAh battery claims to offer up to 240 hours of standby time and six hours of talk time, while it'll come running Android 4.4.2 Kit Kat out of the box. The Tornado 348 also benefits from Kazam's Rescue service, where the manufacturer's customer service centre agents are able to access your device remotely in order to fix any problems you might encounter. The Kazam Tornado 348 will be available from mid-November in either black or white finishes for £249.